Six.io is yet another mobile game with a similar concept/strategies to Agar.io (previous: Agar.io: How to Reach the Leaderboard) and very similar (but better graphics IMO) to the game paper.io. Though these games are simple to learn, it takes time to work out winning strategies. I recently got hooked on Six.io and would play a few rounds of Six.io every day after work. My record is taking over 64.6% of the playing field and 30 kills. And through the last couple of weeks, I've developed a few working strategies to consistently push me near the top of the leaderboard. Before you start, make sure you identify your goal. Do you want to quickly earn coins to upgrade your character or do you want to top the leaderboard? If you want coins, you'll want to focus on kills (each kill gives you 25 coins and this is a much faster way to gaining coins than percentage of captured playing field). If you want to top the leaderboard, then just be aware you will accrue coins more slowly (this is because the strategy of gaining playing field takes time). Coins can always be gained with time and for me, the shape doesn't matter. The strategies outlined below are focused on topping the leaderboard. The following four Six.io strategies are listed in no particular order, but are designed to quickly increase your percentage of the playing field. Note that because the starting location differ every round, the strategies also differ every round. Control a Square, Not a Line - Too many Six.io competitors seem to go with the snake-like strategy to gain space. The problem with a snake-like path is it's too easy for someone to come around and cut you off, negating your previous gains. But building a square (or circle) makes it much more difficult for someone to cut you off. As a bonus, the larger the square, the easier it is defend as well, especially if your enemy is "snaking" in. Just cut him off at the end of your border for a risk free kill... and 25 coins. Control Edges and Corners - If you control an edge, that is one less side you need to defend from your competitors. Even better, if you control a corner, that's now two sides you don't need to defend. This makes it easier to focus on increasing total control. Don't Attack Your Neighbors - I have a policy not to attack my neighbors. I will only defend (and kill) if my neighbor decides he wants to take a substantial part of my space (taking a few pieces is okay). A neighbor protects you from other players, and possibly an attack from multiple competitors. Try to gain uncontrolled white pieces. And when that fateful day comes when your neighbor is killed by another competitor, then take up his space before others do. Don't Attack a Player's Trail - Even though the instructions say to kill a player by hitting his trail (meanwhile making sure your own trail isn't hit), a 1 on 1 duel is a 50/50 chance. Especially with occassional network lag, a split second difference is life or death. Instead, focus on completely surrounding another player as they try "snaking" into your territory. It's much more of a sure spot, especially if they're so far into your territory you each can't see each other. So those are the Top 4 strategies for winning at Six.io. If you're a first time player, I would highly recommend familiarizing yourself with the controls. Make sure you can move right up against an edge or corner and turn without crashing into the wall. That's a lousey way to end your game. Also, unless your mobile data connection is very stable, I would only consider playing this game on a Wifi connection. Any hiccup in the connection is a spell for disaster. And if you haven't already, download Six.io by Apix Games from the Android store. It's easy to learn and quite addictive if you're trying for a high score. 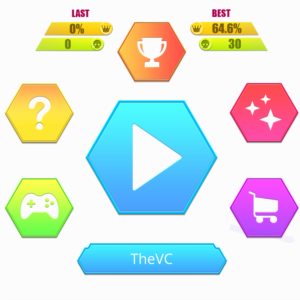 If you see me online, I play as "TheVC". Try to beat my record of 64.6%. Other players have gotten to 100%, so even though its extremely difficult, it isn't impossible.